Last Friday Art went to his scheduled clinic at IU University hospital. Blood tests showed his creatinine levels were climbing dangerously fast – a complete turn-around from last week. The result – he was admitted to the hospital. They tell us to bring a bathroom bag and some clean clothes to every clinic visit in case you need to be admitted. Almost immediately the doctor thought a blood pressure medicine that he had started last week was causing the problem, so he stopped the pills. However, to be certain about what was happening, he scheduled a kidney needle biopsy late in the day on Friday. Biopsy results came back late on Saturday. The doctors informed us that Art was experiencing the same problem with the immune complex clogging the kidney that happened 5 days after the transplant. Everyone thought this had been resolved with a series of plasma treatments where the plasma is replaced with an artificial product. We had planned on having our family Christmas on Sunday. 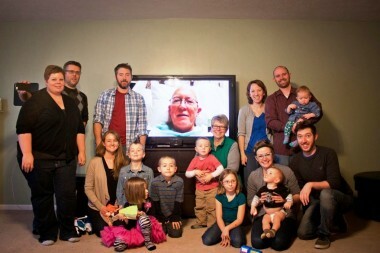 Since Art could not be there we did a “FaceTime” session and displayed his face on a big-screen TV so everyone could see him and he could watch everyone open gifts. 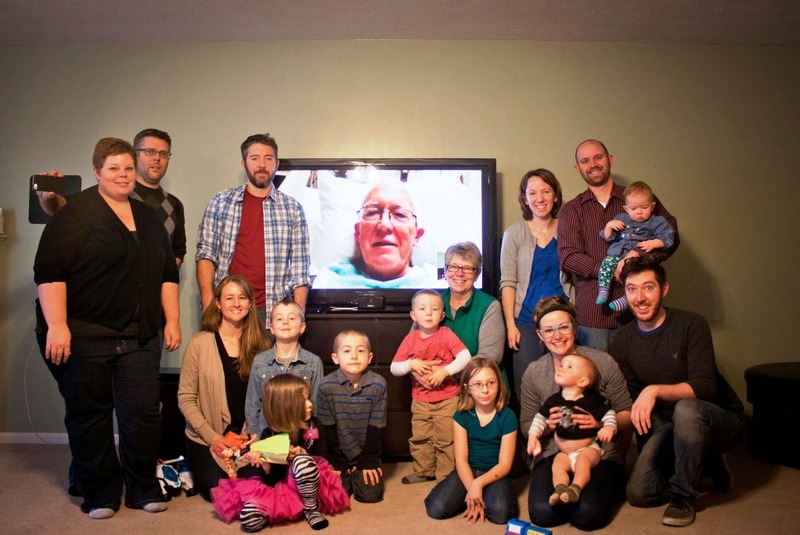 We even did a family picture with everyone gathered around the TV. It wasn’t ideal but was still pretty nice. Another plasma treatment was done Monday morning and in the afternoon the surgery team was ready to install a new central line. The ONLY good thing about it was that they gave Art some good drugs to help with the pain. It took about an hour but finally was completed. This was disappointing since the one he had had for 5 months had just been taken out last week. Later that evening a urologist came to Art’s room and removed a stent that had been put in between the kidney and the bladder during the transplant surgery. Art still shudders when he thinks about the pain involved with the procedure. On Christmas Eve Art had another plasma treatment using his new central line. A doctor then removed the emergency catheter from the inner thigh. He was finally discharged to go home. More plasma treatments are scheduled (which take about 1 ½ hours per session) and some special treatments as they try to completely rid Art’s body of the antibodies causing the problems. So we understand the phrase “it’s not over until it’s over”.